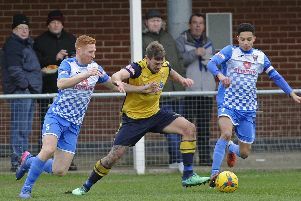 Title-chasing Moneyfields are without suspended striker Steve Hutchings for the Southern League division one south trip to Paulton Rovers on Saturday (3pm). He starts a three-match ban following his sending off against Blackfield & Langley. Manager Dave Carter admits losing his main striker is a big blow heading into an important period. The 1-0 home defeat against Blackfield was disappointing and saw Moneyfields knocked off the top of the league. Carter knows his team didn't do enough to win the game and were particularly poor in the final third. With Hutchings now ruled out he intends to change the way his team plays. Carter said: ‘Hutch is our main striker so we will probably have to change our shape a little. ‘That could suit us at the moment. ‘I am looking for a reaction after losing our last game. 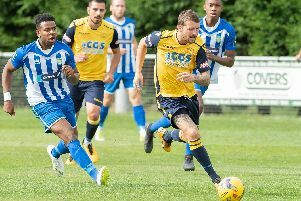 ‘We lacked pace to get in behind Blackfield and there was little cutting edge. ‘Though it was a setback there is still a long way to go in the season. ‘I am sure there will be a lot more twists and turns to come. ‘You will see that top spot change more than a few times yet. ‘What the players need to learn is to maintain their confidence in the things that have got us where we are. ‘That sometimes disappears in the big games. Carter is boosted by the return of central-defender Brett Poate who is back in contention after injury. It was only a few weeks ago that Carter’s side thumped Paulton Rovers 5-1 at Dover Road. Carter, however, has warned his players to forget that. He added: ‘They drew 0-0 with Blackfield recently so we can’t expect it to be a push over. ‘We need to make sure we play with an intensity missing in our last game. ‘Chances will need to be created and taken.